Recently CR started a thread on different rhodié dials on the Langematik Perpetual (click here for a link to that thread). 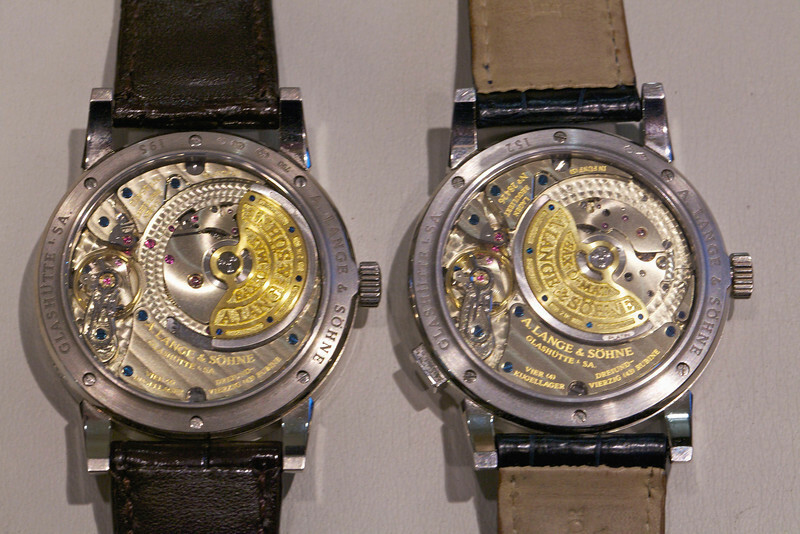 The "current" version of the Langematik Perpetual has a shinier dial with a more metallic shimmer while the original version has a relatively dull gray color. Check out the photos in CR's thread to see the dramatic difference in the dials. We were interested in comparing the dial of the current Langematik Perpetual to that of its cousin, the Saxonia Annual Calendar. Although the lighting conditions were not ideal, the photo below does portray the difference relatively accurately. 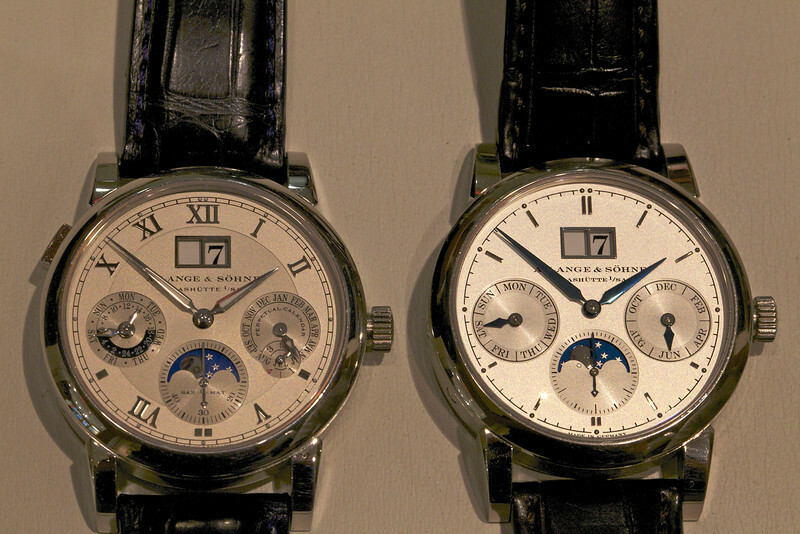 The AC has an "argenté" dial and is a lighter shade of silver as compared to the Langematik Perpetual. I also took a photo of the movement side of each watch. Both watches feature the superlative Sax-0-Mat self-winding movement with zero reset. The movement in the Perpetual is cal. L922.1 and the AC has cal. L085.1. The Perpetual was introduced in 2001 and the Annual followed in 2010. Here is the photo; the Perpetual is on the right, the Annual on the left. Note the slightly "cooler" tone of the platinum case of the Perpetual as compared to the white gold AC. Can you spot any differences in the movement from this side? (Answer below). In fact, the movements are nearly identical. Click here for a link to my 2011 thread on this subject. When other Manufactures decided to add an annual calendar to their line, they designed a new movement from the ground up. Lange took a different approach and simply modified the existing perpetual movement, apparently just changing the program wheel (and adding the 24 hour display and leap year display on the dial). The movement of the Perpetual has 478 components, the Annual has 476. What difference is there in the photos above? As first pointed out to me by Oreoburger, the plate adjacent to the word "Söhne" on the case has two sections in the Perpetual. In the Annual, there is a single plate (and one less blued screw). The Perpetual has two plates in this part of the movement in every photo I have so far seen on Timezone. As I noted in my 2011 thread referenced above, it is interesting that on the Lange website the pictures of the movements are identical. Both movements show the single plate. In fact, the picture of the Annual Calendar movement is just a photoshopped version of the Perpetual movement (or vice versa) with the only difference being the calibre and serial numbers. This leads to the question: has the Langematik Perpetual movement changed so that it now has a single plate in this part of the movement whereas originally there were two plates there? That is my guess. Can anyone with a recent version of the LP confirm this?